The Belarusian championship of bodybuilding and fitness took place in the Minsk Sports Palace from 30 April to 1 May. On 24 April the Orthodox Church celebrated Jesus’ entering into Jerusalem, or the Palm Sunday. The sanctification of willow shoots at the Minsk Cathedral on 24 March. A next meeting of the club of Yanka Kupala and Taras Shevchenko was held in Yanka Kupala Park in Minsk on 24 March. The national subbotnik took place on 23 March. The subbotnik was held to clear up the premises after the winter. The staff of the Central Committee of the Belarusian Youth Union cleared the Victory Park in Minsk. The money they earned will be used for reconstruction of the memorial complex Brest Castle and other monuments. The suit of the Justice Ministry against the Republican Public Association "Independent Institute of Socio-Economic and Political Studies" was sustained by the Supreme Court of Belarus. On 15 April the court ruled that the major independent sociological institute in the country should be closed down. The benefit performance of Belarusian showman Sergey Kravets took place at the concert hall Minsk on 12 April. The shooting sessions of Iskuy Abolian and Novy Ierusalim's clip Another Life took place 10 April in fashion shops in Minsk. The ceremony of awarding the winners of the International Contest Festival "Choice of the Year 2004" that nominates the best goods and services at the Belarusian market and builds up the institution of honor and respect to the outstanding figures of the Belarusian society took place at the Trade Unions Palace on 8 April. The exhibition of high technologies TIBO 2005 was held at the exhibition center BelExpo in Minsk on 5-8 April. The presentation of the book Illustrated History of the Union State, a joint project of the Standing Committee of the Union State, the newspaper UNION Belarus-Russia and the printing house Rossiskaya Gazeta, took place in the National Press Center of Belarus. After the presentation Russian Ambassador to Belarus Alexander Blokhin gave a press conference. The press conference, devoted to the introduction of biometrical visas by the French Embassy in Minsk, was held at the National Press Center of Belarus on 7 April. The street action to remember Gennady Karpenko, disappeared Vice President Victor Gonchar, ex Interior Minister of Belarus Yury Zakharenko, businessman and public figure Anatoly Krasovsky, journalist Dmitry Zavadsky, and to support former minister and diplomat Mikhail Marinich and other political prisoners was staged in Oktiabrskaya Square in Minsk on 6 April. At the beginning of spring teenagers have crowded squares and parks. The monument to Gorky in Gorky Park is especially popular. 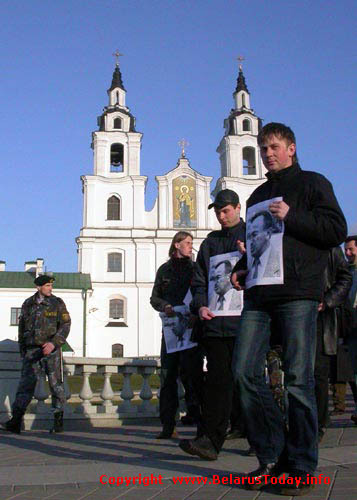 The attempt to hand over the letter to the Russian president at the Russian embassy on the Day of Solidarity of the Russian and Belarusian Nations ended in failure. The flash-mob action to protest against the Information Ministry decree on playing 75% of Belarusian music on Belarusian FM radio stations was staged on the quay of the Svisloch River near the building of the Public National Television (ONT). Young people colored the pavement with names of popular foreign music groups.